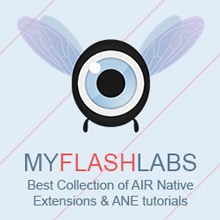 as3c2dm is an Adobe AIR native extension to push notifications with C2DM. C2DM allows you to push notifications to your Android applications without the need to have the app to run in the background in order to receive messages. as3c2dm creates a notification with specified ticker, title and text. When the user taps on the notification it runs AIR application and pass sent message text that is displayed in the app.